Jade is a flexible, relatively easy-to-use, environment for composition and performance. For many Jade has made approaching the complexities of interactive music possible. Now it is available for free as an open-source project. The basic unit in Jade is a Module. Jade has a number of ready-made modules for analyzing, generating, and processing audio and video. These modules can be created using Cycling'74's Max/MSP/Jitter authoring environment. Current Jade development is based on the Jamoma module framework. 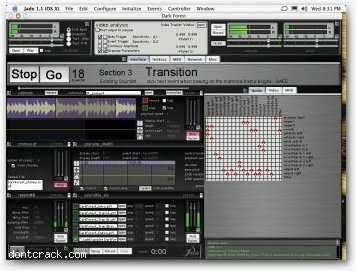 Composers or performers new to software for doing interactive perfomance are often overwhelmed by the enviroments and parameters that need to be managed to get started. Jade uses a single framework that does much of your work for you before you even begin a new project. Dealing with structure is one of the most difficult aspects of working with both music and traditional computer-music programming languages and environments. Jade attempts to solve these problems. How? By providing timing mechanisms, reliable preset storing and loading, a non-linear event list handler that is malleable and easily edited, standard basic services for handling CPU load, and a flexible matrix router. Additionally, for Max/MSP/Jitter users, it encourages habits leading to the reusability of components - all a part of the underlying Jamoma framework's philosophy. In producing effective art and performance, little is more important than how gesture is mapped to parameters, parameters to other parameters, analysis to resynthesis. Creating complex mappings, and then dynamically change them all in a split second can be a difficult task. Another interesting option is generatively creating and breaking new mappings of thier own. Jade has LINK instructions to manage this (in Jamoma the LINK instruction engine is implemented in the jmod.mapper module). Any parameter in Jade can be linked to any other. Any analysis result can be linked to any parameter. In fact, links can be linked to other links. The data can be easily and intuitively scaled, and links can be created or destroyed at any point in time.